Oh no we stink again! Didn’t we trade Luis Gonzales for him? Yes. Up until then Gonzales was a decent hitter. 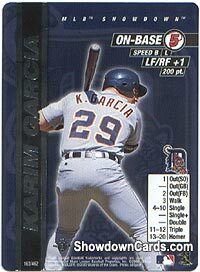 Then the Tigers moved him to the desert for the Latino Bambino and Gonzales' SLG increased. 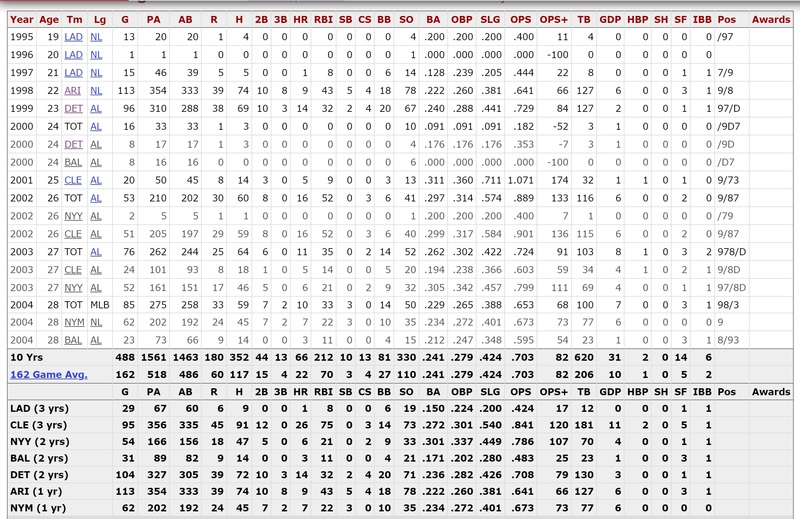 OK, quick, without looking, take away Gonzales' 57 HR season in 2001, and how many career HRs did he hit? He played a very long time, and I think was about a 20 a year HR guy. I'm going to say 250 without his 57 HR year. The Latino Bambino! He was still playing in Mexico a couple of years ago. Marcell Ozuna in one of the best gif's ever. That's as mesmerizing as the Delmon Young circle gif. I remember being in Phoenix in 2001 to see the Tigers play the Diamondbacks. Listening to local radio that afternoon (remember local radio? ), Luis Gonzalez was being interviewed by a local sports jock, and when the subject of his time with the Tigers came up, Gonzalez more or less dismissed it like it was a bad dream. I didn't much care for him after that. Hey fun fact: almost two weeks into the season, the Seattle Mariners have hit more home runs (33) than the Tigers have scored runs (29). We got a regular Jayson Stark over here. Oh, are we not talking about the Tigers anymore? Are we talking about me now? I would say I'm a rather irregular version of Jayson Stark, because I could never keep up with the volume of fun facts that he does. Well, it ain't like Detroit was a desirable team to be on at the time. 65-97 on the season. Buddy Bell quit/fired. It probably wasn't much of a fun time. Oh, it's fine to feel that way in his heart. A person feels how they feel about things. No argument with that. I just think it's uncool to articulate it in public is all. It reflected worse on him than on the team he was slagging. Maybe, maybe not. But the team sucked, and I imagine that leaving a winning situation in Houston for the dumpster fire in Detroit probably wasn't a good time. 98 was bad.. Buddy Bell went to Randy Smith and wanted to talk about his contract situation and Randy said "Well you haven't been too good..." and Buddy said "Well you've given me a lot of **** to work with..." and Randy said "No, these guys are better... if you don't like it then you're fired"
Please Cleveland, don’t shoot me in the face! Hey, everybody has a little trouble with the wind once in a while. Looking forward to seeing Ace Boyd throw 20 strikeouts today. Not for three years and only once he's passed 30 and has reached Josh Harrison levels of performance.